Monae's meteoric rise to stardom over the past year can be represented through the size in venues she's been playing, but everything about her music and work-rate has merited it. She's toured tirelessly, offered performances to any TV music show that would have her, and collaborated with some established stars. One could argue that there's been a carefully orchestrated PR campaign behind her since day one, but still - that a new artist could release a debut album like The Archandroid remains staggering. Her sci-fi concept and high art/pop culture referencing painted a full and rounded characterisation, which Monae has unfailingly lived up to or explored critically in interviews and broadcast performances. I'd always considered, a little perversely, that theres a similarity (and a crucial difference) in her bold embrace of hi-concept and Lady Gaga's. That both artists careers could be seen as self-fulfilling prophecies - Gaga needed money behind her to reach a vision or level of artistry, and similarly - MonÃ¡e has benefited in this way, in her ability to form a coherent and articulate concept across a variety of media. That doesn't come cheap. But whereas Gaga offers little but excess and irony, used to mask an emptiness of content - Monaes created world is a parable for our own, an imagined reality where philosophical debates can be had. Intelligent language, engaging and relevant discussions around identity, transhumanism and the nature of love - articulated through the matrix of pop music. Inside the Roundhouse, 20 minutes of afro-beat interlude gave way to a wonderful combination of pre-gig songs: The Jackson Five's I Want You Back followed by Stevie Wonder's Higher Ground. The impressively diverse audience bobbed their heads automatically, most people got their groove on. It was hard not to look around and smile, and made for an enjoyable aperitif. Then, as Stevie played out, the lights dimmed and the orchestral hum of 'Suite II' began. A master of ceremonies gave a brief speech, clad in trademark tuxedo, rousing the crowd into a pantomime frenzy, before a brief film orated by Monae's fictional alter-ego Cindi Mayweather. We were warned against false choices and told that Janelle Monae had been sent back in time to guide us towards epiphanies. And then, in an instant, the stage was full of movement, colour and spark- Monae's ten piece band bursting into life. Starting as the album does, with the 3-pronged attack of 'Dance or Die', 'Faster' and 'Locked Inside' - the performance didn't give anyone, least of all Janelle MonÃ¡e, a chance to catch their breath. And under the dizzying light show, numerous dancers, and energetic band performance - the effect was a little lost under a terrible audio mix. Booming bass drum was about all you could hear of it - but after the closing bars of 'Locked Inside' had sounded and the audience given a chance to applaud, the mix seemed to have been resolved. A quietened stage was dimmed and the band stripped down to guitar, bass and drums - a rousing rock indulgence occurred briefly, but gave way to enigmatic six-stringer Kellindo Parker enjoying a moment of prog-soliloquy. 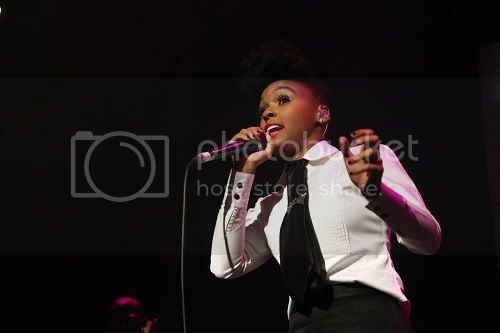 Truly exceptional soloing later, and Monae returned to the fore- the two figures enjoying a languid, drawn out, beautifully rendered version of the Charlie Chaplin standard 'Smile', here recreated as a foil for Monae's staggeringly malleable voice. This was the concert breathing, and Monae's chance to introduce herself. From a frustrating start to a moment of undeniable beauty, and her band returned. 'Wondaland' followed, and was sheer euphoria - the studio recording's cold, precise synths replaced by New Orleans brass. This, for me, was the turning point. Everything she and the band did afterward was made of magic. During the proggy 'Mushrooms and Roses', MonÃ¡e was given an easel and cape, painting lucid abstractions as dancers clad in black arced uneasy patterns, marauding the stage. The finale was supreme; the anthemic 'Cold War' transgressed 'radio friendly' to become stadium filling - it's sky-shattering guitar solo rippling the air as MonÃ¡e poured herself into the song's epic, wailing close. And without so much as a breath, 'Tightrope' was set loose- it's insistent beat of foot-stomps and finger-clicks jangling against Monae's sassy spoken word verses. Here again, the live brass was central to the song's effect - but for me, it was the early EP cut 'Many Moons' which provided the highlight, its skiffle beat collating backing and lead vocals into a whirlwind. 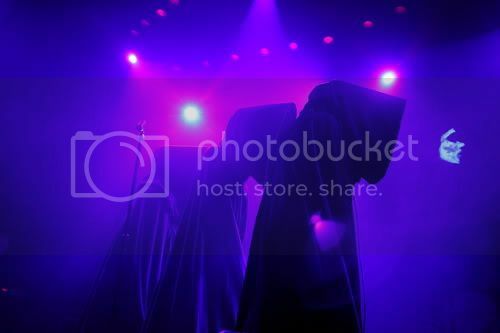 On previous tours, the band have employed synth horns and even an overdubbed brass recording - I guess two successful low-key tours does give you license to hire a couple of horn players, and these guys could shimmy. It amplified the sound, gave it a real bounce and sexiness. Making the performance that much more visually engaging too, the horn section swayed and pogo-ed from side to side in unison at points, marking each rise and fall with appropriate choreography. It didn't end there - Kellindo was a force, looking like Andre 3000's younger, even- crazier brother - he was in full "rock" mode throughout, all jumps and behind-the-head solo-ing. The drummer twirled his sticks between snare hits. Her entire band was next level, both in technique and performance - each musician made for a compelling watch, and the spectacle was in total, overwhelming. I've heard criticisms of Janelle Monae's live show that it's not a real concert as such, and true - this didn't feel like a moment of communion with the audience. Which needn't imply that we were being played "at", rather that this experience, and Monae's public persona as a whole - is to be taken as a performance. Would I have it any other way? That she had broken character and engaged the audience with a sweet but ultimately facile "how are you London, nice to be here?" No - Monae is proof that compromises needn't be made in the relationship between high art and mass culture, that intelligent discussions can be had whilst having ridiculously good fun. During the closing number 'Come Alive', the riff was extended to a call and answer with the audience before Monae and band fell to the floor, dead, urging the audience to do the same. The odd naysayer refused, standing ground in a sea of people sitting. Monae simply sung back "I'm not getting up til you get down" - and inevitably, the miserable fools relented. Such ego is intolerable here, this is community territory - as evident by the collective bows that took place when the band and accompanying Wondaland Arts Society returned to the stage ten minutes after finishing their encore. Monae introduced each musician by name, and thanked us for sharing. It was a moment that reinforced the theatrical dynamic, but one that gladly lent an air of humanity and sincerity to the show. MonÃ¡e raises the bar for 'artists' the world over: It's no longer enough just to write concept songs or allude to literary references for their own sake- The Archandroid tour is a complete vision, meticulously crafted, and stupidly enjoyable.